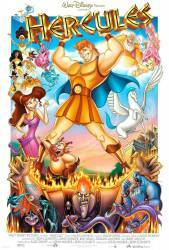 Continuity mistake: Five white teenage girls burst in on Hercules & Phil & run toward the camera. In the following shot, the girl in blue has changed into a black girl. Continuity mistake: During Hades' meeting with the Fates, he walks to a table to explain his plan. Between shots the things on the table change. Deliberate mistake: In Thebes, Phil beats up the guy and he gets a black eye, but seconds later the black eye is gone. Continuity mistake: When the gods are walking down Mt. Olympus in chains, Hephaestus is in front of Aphrodite. But after Hercules cuts the chains with his sword and frees the gods, Hermes is in front of Aphrodite, and Hephaestus is nowhere to be seen. Continuity mistake: When Phil falls off Pegasus, he hits a pillar and gets knocked out. A few minutes later, after recovering, his position is different and the pillar is gone. Continuity mistake: In the shot of the gods after Hades makes his joke about moussaka, Dionyssus is close to Aphrodite and Athena's owl is on her left hand. Then as Hades asks "Is this an audience or a mosaic? ", Aphrodite is further from Dionyssus, and Athena's owl is on her right hand. Continuity mistake: When Hercules opens the case, all that falls out are two pots, two bowling pins, a helmet, a sword, and two pairs of armor. A purple cape, two shields, many other pots, a sandal, a trophy, and a white ball with a blue stripe are among many of the additional items that appear out of thin air in the very next shot. Continuity mistake: As the Fates cut their first victim's string of life, between shots they move further away from the nearby window. Continuity mistake: Five girls run in to mob Hercules, but only four run out. Continuity mistake: The amount of vines on the case Phil pulls out of the bushes changes between shots. Continuity mistake: When Hercules is on his knees in the temple of Zeus, in some shots he is on bare stone, but in other shots he is on the ceramic design. Continuity mistake: When Hades says "Here I am kind of river guardian-less" you can see a chess piece of a centaur on the board near to a lot of other pieces. The when Meg flicks the centaur off the board, the other pieces are gone. 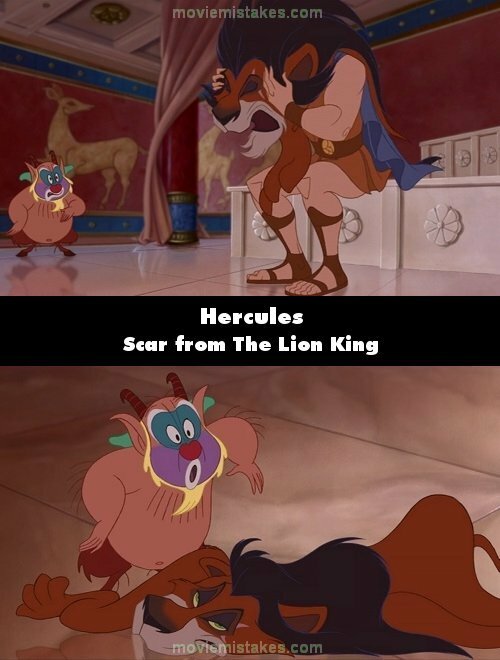 Continuity mistake: The pile of chains and other items change after Hercules throws Phil into it. Continuity mistake: At night-time, Phil is standing on Pegasus' head in front of a "head-light". The head-light disappears from Pegasus' head after the above shot. Continuity mistake: In Thebes, when a vendor opens his cloak and asks if he wants on sundial, his fingers go from being underneath the cloak to over it. Continuity mistake: In the first scene involving the Fates, the hands of the green one are perfectly fine, and it is not until Hades places the eyeball in her hand that all the disgusting brown spots and hairs appear.